Screen grab from 'humansofny' Instagram. Some 30,000 medical students across the United States on Friday learned where they would be heading next year. Each student opened an email or an envelope; inside was the name of the residency program where they’d been accepted. For many residents, the revelation was a source of joy. For others, relief that they had matched at all. But for some, it could be the beginning of a nightmare. In America, becoming a doctor can prove fatal. Suicide is estimated to be the second leading cause of death among medical residents, after cancer. (In contrast, the leading cause of death in the general population for that age group — 25 to 40 — is trauma.) Suicide statistics for young doctors are difficult to track because many deaths go unreported as such. But we know that 300 to 400 American doctors complete suicide each year, twice the rate of the general population. Just last May, thousands of medical residents across the country took a moment one evening to reflect on the suicide of an unnamed psychiatry resident at NYU Langone Medical Center. While NYU Langone provided a statement, no further details were given about the resident’s age, exactly where she worked, or where she was found. Her death seemed inexplicable; her life erased with no clear rationale. Within a few months, two more women in the New York City medical community would take their lives. Perhaps it was the long work hours, we in the medical community thought. Or maybe a difficult breakup. Maybe the women were depressed and hadn’t received adequate treatment. Then again, maybe it was something else that many of us were all too familiar with. A few weeks after the NYU resident’s death, physician suicide expert Pamela Wible asked a question many of us had been discussing in private: Could it have been bullying? Wible disclosed some of the letters she had received from a resident at the same hospital suggesting the victim had been emotionally abused by her supervisors. If so, it wouldn’t be the first time a resident had been bullied to death. THERE’S NO QUESTION that bullying is endemic in medical education. One study revealed that about half of residents and fellows in the U.S. reported being bullied, most often by their attending physicians. Canadian researchers found that 78 percent of residents surveyed reported being bullied and harassed in their training, often by attendings or program directors. And residents aren’t the only victims at risk; patient care may also suffer. Studies have shown that if a resident is distracted by the additional cognitive load of bullying and mobbing, he or she is more likely to commit errors. General patient care can also be negatively affected; bullied trainees may be less empathetic because they’re consistently in fight or flight mode and may fail to communicate as effectively with their own patients. Search “bullying in residency” and you’ll get thousands of hits, from heart-wrenching blog posts to short opinion articles to forums on sites like Reddit or Quora where residents anonymously share their experiences and advise targets. There are tales of discriminatory remarks. There are performance reviews in which attending physicians detail fabricated incidents that the residents can’t refute. The post has nearly half a million likes. STORIES OF ABUSE abound. Daniel (not his real name) was a perky and bright medical student who moved from a small town to a larger city to pursue a primary care residency. Naturally curious, dynamic, and passionate about the social issues affecting his patients, Daniel noticed that his goals — social justice and medicine — didn’t align with the program’s values. He struggled to continue his work in child advocacy, which he had begun in medical school and which the interviewers had assured him they would support. Nevertheless, he adjusted and made close friends. In his second year, Daniel started a high-pressure rotation in neonatology and that’s when things began to spiral. It was his first time in that demanding environment; his peers had previously completed electives and were used to both the medicine and the intensity. Daniel tried his best to catch up, reading for hours each evening. But he always felt like he was struggling. What’s worse, his background reading put him directly in his supervisors’ crosshairs: Instead of embracing Daniel’s independent research as a sign of intellectual curiosity, his superiors accused him of questioning their expertise. No matter how much Daniel worked, he was constantly, and publicly, berated by one particular attending if his management plan wasn’t exactly what she would have chosen, even if it aligned with another staff member’s from the week prior. The feedback was punitive and demeaning. After hanging on for another few months, Daniel quit medicine altogether, forfeiting his four years of undergraduate pre-medical studies, four years of medical school, and two years of residency. That amounted to hundreds of thousands of dollars invested in his formal education, and years working towards a goal of caring for patients. “I had never, and have never since, experienced such a toxic, destructive, and demoralizing environment,” he says. THERE IS VERY little research on bullying in medicine because, ironically, few medical programs are willing to participate in research studies. They may, rightfully, be concerned about the findings. But we do know that the bullying tactics in medicine are identical to other industries. It takes many forms: intimidation; threats of career ruin; belittling; undermining; unjustified criticism; spreading gossip about the resident; work interference or sabotage; blocking promotions or opportunities at other clinical sites; setting trainees against one another which can include complying with bullying actions. The list goes on. But the stakes are often higher in medicine than in other sectors. Friday’s Match Day assigns trainees to a specific program, ostensibly trapping them into a potentially impossible situation. Once matched, a resident becomes bound to that program until their training is complete. If they experience debilitating bullying, residents are contractually obliged to stay, even though research shows that this is the second most common reason for seeking a transfer. Like Daniel, Lara found herself bullied when she joined the Intensive Care Unit (ICU) as a second-year resident. The behavior began one day when she accidentally presented the wrong patient to her supervising attending and fellow residents during rounds. She caught herself and immediately apologized, but the staff member went on the attack, berating her for violating patient confidentiality and accusing her of incompetence. Feeling defeated and cornered, Lara could say nothing and accept the abuse, or say something and risk being labelled unprofessional. She chose to stay quiet. Within a few days, nearly all of Lara’s supervisors began to act as adversaries. They seemed to be waiting for her to make mistakes so that they could point them out. Lara knew that these physicians — who were all female — regularly met in private to review her performance and behavior. From the consistency of their language, she began to worry that they were conspiring against her. During Lara’s mid-rotation performance review, her superiors told her that they had observed incidents which Lara felt had been either grossly misinterpreted or simply fabricated. When she tried to defend herself, backing up her claims with documentation, she was branded as “unprofessional” and “unable to take feedback.” One of her ICU attendings even suggested that Lara quit medicine. Then the nightmares began — dreams that mirrored real life. Even in sleep, the ICU and the abusive attendings haunted her. The program director suggested that Lara might have an underlying psychiatric disorder and referred her to a physician health support program for an in-depth psychiatric assessment. Lara had never had a mental health condition prior to residency, but was diagnosed with workplace-induced anxiety, which required therapy. Soon she was on probation; she was told that this decision had nothing to do with the diagnosis and everything to do with her “poor performance.” But one possible outcome of probation was dismissal. Were Lara’s superiors setting her up? TO A CERTAIN EXTENT, medical education rewards obedience, and that’s precisely what makes it ripe for abuse. Medical ethicist Ajay Major notes that attendings may celebrate “ethical and professional chameleons” — those residents who rarely oppose their superiors. In this climate of fealty and cloying respect for authority, many residents view their advanced medical training in part as an introduction to medicine’s “hidden curriculum.” Their success depends on understanding and playing by these rules. Typically, bullies twist concepts, such as professionalism, to shame residents who express divergent viewpoints, and Lara certainly experienced that. Bullying may also be deeply ingrained in medical tradition. William Bynum, a family physician based out of Duke University, researches shame and intergenerational trauma in medical education. “It’s possible that those doing the bullying were bullied and shamed themselves, and they then channel that unresolved conflict onto others, especially those at lower levels of the hierarchy,” he says. That’s why high performers like Daniel can be deemed a threat to attendings who feel insecure about their own position and abilities. LARA HAD BEEN mobbed — a form of bullying that encompasses groupthink and collusion among leadership. She knew that if she stayed at her hospital, she would very likely be fired, as the probation period relied on repeating a rotation in that abusive ICU. Fortunately, as part of her mental health accommodation, she was permitted to complete that rotation at another institution. In the new setting, her performance was deemed excellent, so she continued to progress and will finish her training next year. Lara (not her real name) was one of the lucky ones. Bullied residents have turned to substance use; some become so severely depressed, like Daniel, that they quit their program. Even witnesses to negative acts such as mobbing can experience psychological effects, reflected in high turnover. And of course, there is the specter of suicide. In 2017, the World Medical Association issued a statement about the need to address bullying and harassment in medicine. The American Medical Association, British Medical Association, Royal Australasian College of Surgeons, and the Canadian Medical Association followed suit. Regulatory bodies in the U.S. and Canada are beginning to refine how bullying should affect accreditation, and permit individual physician complaints if they experience mobbing, bullying, or harassment — much as a patient would — as the behavior violates established codes of professional and ethical conduct. Some American institutions have responded by changing the match system. In Texas, for instance, through the “FITXBEST” initiative, surgical programs are adding additional strategies during the interview process to help ensure fit. Staff interviewers are trained to recognize their unconscious biases, while focusing on questions that shed light onto the learning style, goals, and personality of the candidate to determine fit and their anticipated level of support in the training culture. Residents are also stepping up to protect each other. The trainee-led website Scutwork.com acts like the “Glassdoor” of residency programs. The hope is that with enough feedback it should paint a fair picture of programs across North America and nudge the most problematic ones to change. And finally, there’s a new anti-bullying movement: TimesUp Healthcare. In a Lancet editorial last month, the leaders of this group outlined a roadmap for hospitals and training programs to address mistreatment. They recommended incorporating bystander and civility training, sanctioning perpetrators, improving reporting mechanisms, and being transparent about the number of complaints and lawsuits. For trainees, transparency will help them avoid so-called malignant programs, while also motivating these programs to change so they don’t deter applicants. BY THE TIME you read this, another doctor in North America will likely have completed suicide. This person may be a resident, someone in his or her late-20s, with a decade of expensive schooling and training behind them, and countless hopes and dreams ahead. Several hundred more will have thought about taking their lives. As a physician, I have had to acknowledge that those who I’ve most admired haven’t always behaved ethically. They haven’t always had their trainees’ best interests at heart. Power and perceived threats to egos are unseen and sinister forces; respected leaders, in turn, have failed to model integrity. 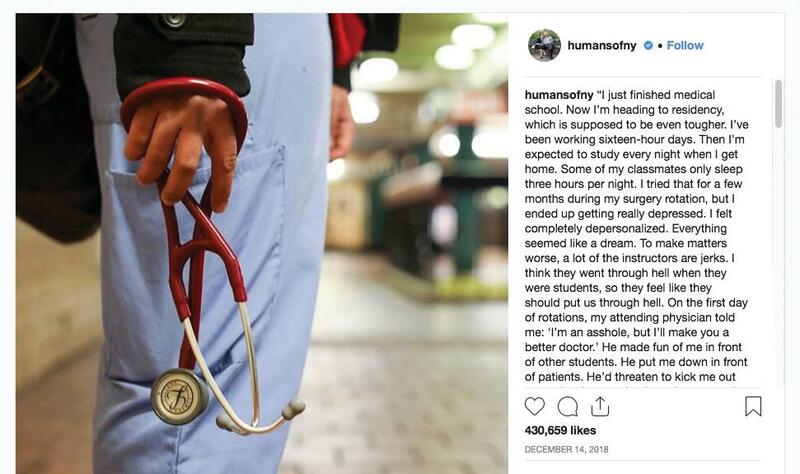 But above all, the greatest irony is that in the relentless pursuit to heal the sick, many doctors have put the next generation of physicians in harm’s way. If you or someone you know is having suicidal thoughts, there are resources available to help. The National Suicide Prevention Hotline number is: 1-800-273-8255. The Samaritans Suicide Prevention Hotline is 877-870-4673. The new Canada Suicide Prevention Service (CSPS) by Crisis Services Canada, enables callers anywhere in Canada to access crisis support by phone, in French or English: toll-free 1-833-456-4566 Available 24/7. Amitha Kalaichandran, M.H.S., M.D., is a resident physician, epidemiologist, and writer, based in Ottawa, Canada.